Is Trump not entirely bad? 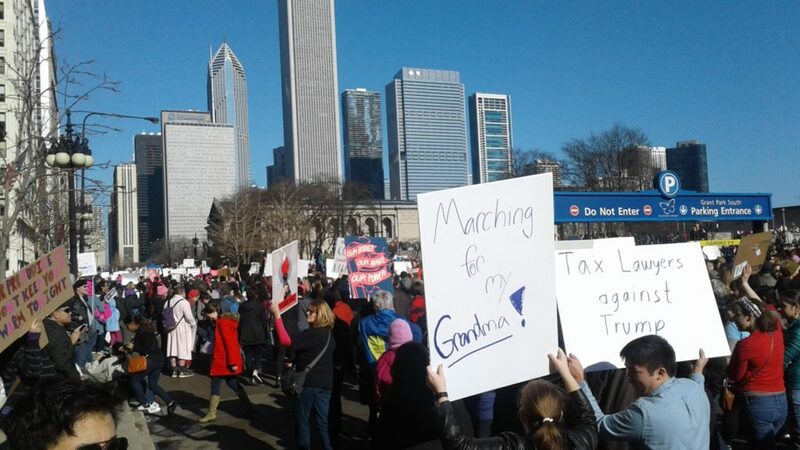 Photo of Jan 21 2017 women’s march by Bob Matter. But are they? Sure, there’s a sign, but it’s hand-lettered, and carried by one guy. Maybe he’s a tax lawyer, and maybe he’s against Trump. But tax lawyers ain’t stupid. Nor impoverished. I bet they like whoever runs the government, and with Trump suggesting new rules on repatriation, a “border tax,” and a new “Dependent Care Savings Account,” which can be for benefit of the unborn and qualify for matching funds, there’ll be plenty of work for tax lawyers. Maybe they hired an out-of-work actor to try to build some sympathy for their profession. None of the above is meant to suggest that Hillary, or Jill, or even Gary would have reduced the demand for tax-related legal advice. As Henry George might have said: “It is not kings nor aristocracies, nor tax lawyers nor accountants, nor landowners nor capitalists, that anywhere really enslave the people. It is their own ignorance.” That’s why we have a Henry George School.